Days before the Scarefest, Haley would cry as I leave the house because she wanna come with me to the office already. So when the day came, words just can't describe how happy and excited she is! 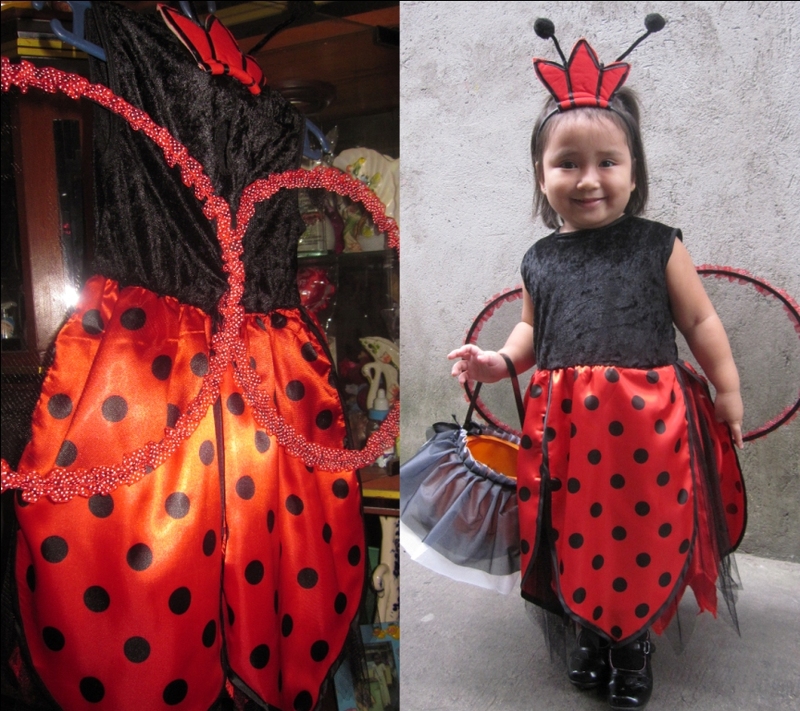 (L) When we bought her costume, we're no longer after what's spooky or one-of-a-kind. We looked for what's comfortable for an almost-3-year-old and something that will fit her to a T.
Let me do it a la fashion blogger, just because. Haha! Skirted Trick or Treat bucket from SM also at PhP 100. For only 800 bucks, achieve na achieve, di ba? They stayed at the pantry while waiting for the program to begin. And of course, took pictures (the two shots above are taken there as well). Here's Haley with our beautiful momma! I just had to pose with King Pig. The astronaut and the fairy are siblings. I love it when I hear them talk cause they speak very fluent English. I swear my kids will be like them! Haha! I won't miss a photo with this blue bird, inside the makeshift iPod. Funny thing is that you have to guide him around cause he's blind. They forgot to create a hole in the costume for his eyes! Hahaha. Finally, the program started. First, they gathered the kids in the conference room for some snacks and film showing. After the mini fashion show, the main event was next... Trick or Treat! Haley and Jaren all set to get heaps of candies and chocolates. I had to include the 2 photos above (even if they're blurred) cause it captured Haley's experience trick or treating. Her bucket is getting heavy but the show must go on! Haha. Oh, do visit Jejo's blog - she's got some great stories and photos to share as well! Haley with the Queen and her lady royals. Haley and Junie at Hogwarts. I was so proud of Haley because she was well-behaved the whole time. Some booths have zombies and ghosts and other spooky creatures -- she got scared but she didn't cry. She just closed her eyes and let me hold her hand until we're done. Good job, little girl! Here she is at my cube - tired but would still smile for the camera. I trained her that way. Haha. One last shot before going home -- right at the middle of one of Makati's busiest streets. Haha. Thanks a lot for the awesome Halloween event!